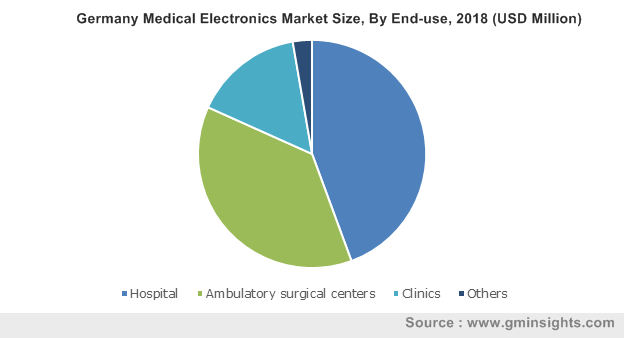 Medical electronics market size was valued at USD 73.3 billion in 2018 and is expected to witness 13% CAGR from 2019 to 2025. Growing preference for minimally invasive surgeries will foster medical electronics market growth during the analysis period. Adoption of medical electronic devices such as patient monitors and other diagnostic devices is specifically high in minimally invasive surgeries. Minimally invasive surgeries are safe, patient-friendly and cost-effective. As a result, these techniques are being adopted across various healthcare fortes that have positively impacted the demand for medical electronic devices. Moreover, regulations implied on the manufacturers of the medical electronic devices ensure superior quality of technologically upgraded medical devices that further raises its adoption in surgical procedures escalating the industry growth in foreseeable future. Therapeutic segment was valued at USD 18 billion in 2018 and is anticipated to have significant growth during the forecast timeframe. Demand for therapeutic devices such as pacemakers, implantable cardioverter defibrillator devices and others is increasing conjointly with the rising prevalence of cardiovascular and neurological devices. 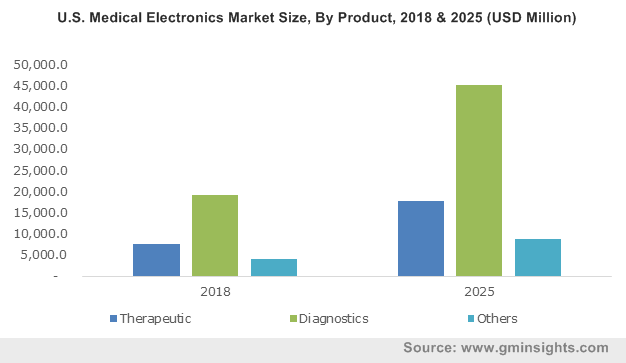 Moreover, favourable demographic trends in European and North American countries will propel the demand for therapeutic medical electronics devices segment over the forecast timeframe. Diagnostic segment held considerable revenue share in 2018 and is anticipated to witness 13.1% growth during the forecast period. Increasing awareness regarding benefits of early diagnosis will propel the demand for better and accurate diagnostic medical electronic devices. Furthermore, growing prevalence of genetic diseases will foster the demand for diagnostic medical electronic devices augmenting the segmental growth. Hospitals segment accounted for 45.5% in 2018 and is anticipated to have significant revenue share during the forecast timeframe. Growing prevalence of cardiovascular diseases and respiratory infections in geriatric population has raised the number of hospital admissions. Also, hospitals covered under public healthcare system in developed as well as developing countries are well-equipped with highly efficient medical electronic devices that should spur the segmental growth in forthcoming years. Ambulatory surgical centres segment will grow at 13.1% during the analysis period owing to growing number of surgical procedures being performed in ambulatory surgical centres. Ambulatory surgical centres provide treatment at significant low cost than hospitals. The low cost is due to the high operational efficiency that helps in saving patient’s money. Moreover, ambulatory surgical centres provide specialized care and treat patients in a way that significantly increase patient satisfaction. Thus, above-mentioned advantages of ambulatory surgical centres are expected to boost segment growth over the forecast period. 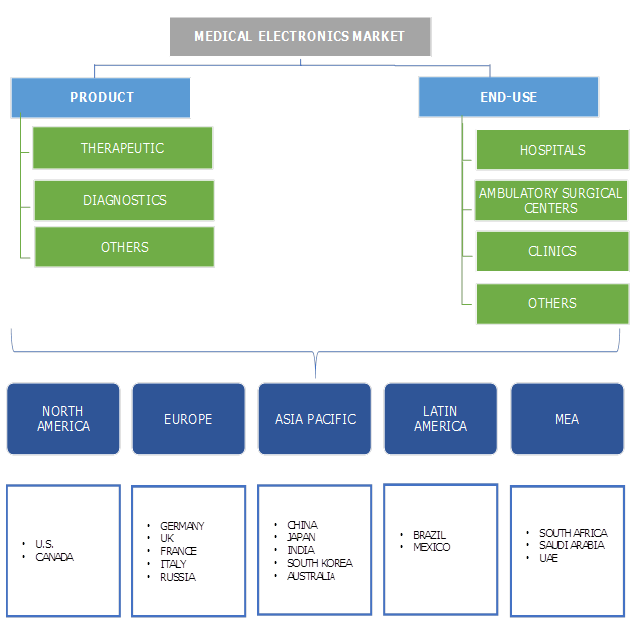 North America medical electronics market dominated the industry with USD 32.9 billion in 2018 and is anticipated to show similar trend over the forthcoming years. Major factors driving the North America regional growth includes high healthcare expenditure, increased income levels and high adoption rates for advanced medical electronic equipments. Also, high patient awareness about the benefits of early diagnosis will boost the demand for medical electronics during the forecast period. Moreover, developed infrastructure coupled with the access of advanced diagnostics technologies will positively influence regional growth in upcoming years. 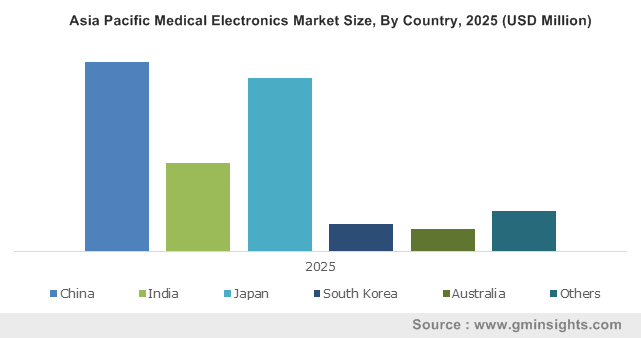 Asia Pacific medical electronics market will witness lucrative growth of 13.7% over the forecast period due to rising geriatric population that is susceptible to chronic diseases and infections. Growing adoption of medical electronic devices utilized in diagnosis and treatment of chronic diseases has reduced the mortality rates that proves beneficial for the industry growth. Additionally, government in developing countries such as China implements certain initiatives that ensures availability of superior quality medical electronic devices thereby, fostering the regional growth in forthcoming years. Some of the leading companies in medical electronics market include GE Healthcare, Phillips, Siemens, Medtronic, Fujifilm, Hitachi, Samsung and Toshiba. Other notable players include Boston Scientific, Olympus, Carestream Health, Allengers Medical and Maxim Integrated. Intense competition is observed among the companies as they focus on offering innovative product. Mergers, acquisitions, new product launches, geographic expansion and partnerships are some of the strategies strategically implemented by the companies to gain competitive advantage. For instance, in October 2017, Olympus corporation announced the launch of its ORBEYE Surgical Microscope. The launch was envisioned with an aim to incorporate the latest advances in 3K and 4K technology in America and Japan. Introduction of new devices will boost Olympus’s existing product portfolio thereby, boosting its profits. History of medical electronic devices utilized for diagnosing diseases can be traced back to early 1700’s. In 1714, Daniel Fahrenheit invented the first mercury thermometer that is still used to sense the body temperature by the drop of mercury levels. Later with advancements in medical field, in 1901 Rontgen discovered X-rays that currently finds application in diagnosis of various diseases. Since then, several medical devices have been introduced that have helped in diagnosis with minimum errors. Currently, there are drastic changes in the diagnostic methods and the medical electronic devices that were developed earlier have now being improved to impart at most accurate readings. Key industry players have increased their R&D efforts to introduce highly efficient medical electronics that have decreased the mortality rates that has a positive impact on the industry growth. Besides, the medical devices industry is still in developing phase and will witness various growth opportunities with further advancements in technology.